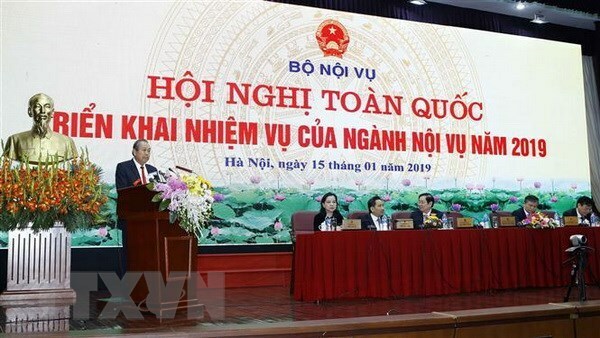 Hanoi (VNA) – It is a must to ensure the rate set for personnel reduction in targeted agencies and take synchronous solutions to ensure workforce quality, said Deputy Prime Minister Truong Hoa Binh. “Those with ineffective performance should be replaced,” the Deputy PM said while addressing a meeting of the Ministry of Home Affairs (MoHA) in Hanoi on January 15. He asked the ministry to coordinate with relevant ministries and agencies to provide consultations for the Government in building an effective and modern administrative system, with attention paid to reforming wage policy and improving the quality of public services. The ministry was also urged to better the inspection work, promptly prevent and detect violations in personnel work, and review tasks and organisation of State administrative agencies in order to make suitable job allocation proposals. The first job is to complete draft laws, ordinances and projects within the working programmes of the Politburo and Secretariat, and propose the Government issue documents guiding the implementation of laws, he said. According to the official, streamlining the apparatus is the most outstanding achievement recorded by the MoHA in 2018, noting that the ministry has applied information-technology (IT) in management, contributing to building the e-Government. According to the MoHA’s report, as of December 27, 2018, the number of departments or department-level units in ministries and ministerial-level agencies stood at 248, down 12 organisations. As of 2018, up to 40,500 personnel had been removed from the pay list of State agencies under the Government’s Decree No. 108/ND-CP. The number is expected to reach about 44,510, he said.